Many friends who like to travel and camp are often troubled by sleeping outside, worring about the bad weather,the quality of the tent,or the function of the tent. Well,Your problem will solved here,our tent will solve your sleeping problem outside.Our product is professional designed for you,it is an off-ground portable tents, keeping the tent from directly touch the ground and easy to be wet,the bed and the tent are very strong and durable,no worry about bad weather and location any more. The camping tent is very portable and easy to carry in a small storage bag,easy to install,2 minutes can be installed.Besides,The portable tent can be freely dismantle. Our camping tent is 100% high quality,if you want to have a nice tent,just buy it!!! Camping Tent Size:79 x 26 x 42 inches / 200 x 66 x 105cm . Package Size:22 x 5.9 x 5.9 inches / 56 x 15 x 15 cm . Professional Design：This is an off-ground portable tents,which can be builted without digging trenches and drainage,keeping the tent from directly touch the ground and easy to be wet, no worry in rainstorm weather.And it has a strong and comfortable bed,no need to carry the inflatable mat and ground mat during travel any more,thus streamlining the outdoor travel equipments. 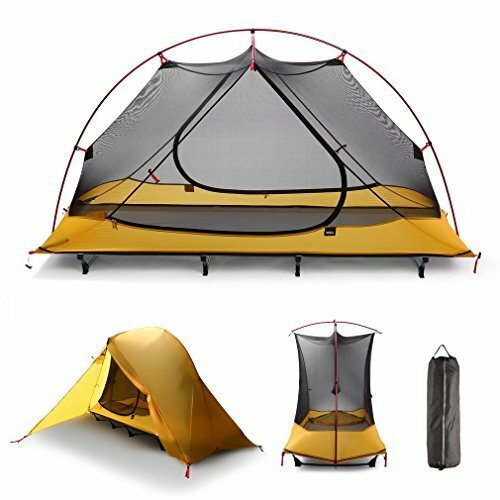 Ultra Convenicent: The camping tent is very portable and easy to carry,it can be folded in a storage bag.It is also easy to install,2 minutes can be installed. Really portable and convenicent for your travel. Ultra Strong and Durable: As showed in the picture,the bed is very very strong and durable.And the portable tent is waterproof and windproof,stronger than the general tent.No worry about bad weather and location any more. Easy To Split: The bottom zipper of inner portable tent can be freely dismantle, so it not only can be a tent,but also can be a separate leisure bed. Camping Tent Size:79 x 26 x 42 inches / 200 x 66 x 105cm .Package Size:22 x 5.9 x 5.9 inches / 56 x 15 x 15 cm .Weight: 2572g .Package weight: 2600g.Type :1 - 2 Person Tent. If you have any questions about this product by iUcar, contact us by completing and submitting the form below. If you are looking for a specif part number, please include it with your message.